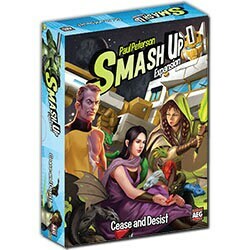 Smash Up: Cease and Desist Expansion. We’re gonna totally get busted. Smash Up: Cease and Desist brings you some of the coolest new factions that are TOTALLY not anything at all like some awesome movies and TV shows that we are really into. Not at all. Astroknights use the power of the Fours to defeat your enemies. The Star Roamers move about space, teleporting your minions from one quadrant to another. Changerbots can transmorph into various forms, with new abilities and strengths. And finally the Ignobles fight over the king’s seat, but don’t trust any of them! Contents: 4 factions with 20 cards each, 8 base cards, 4 card dividers, 1 token sheet, rulebook. Players: 2 players, ages 14+.